New York, N.Y. 10016. Include any photos, drawings or logos it required. 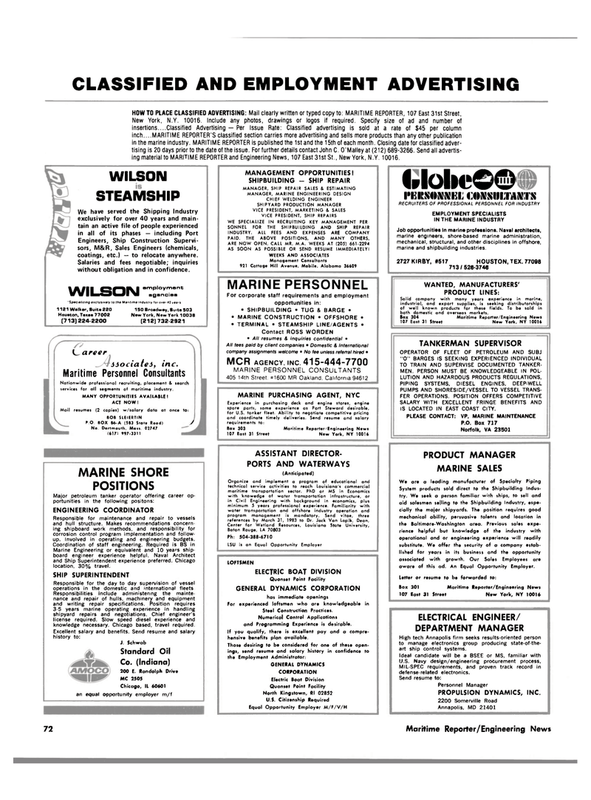 Specify size of ad and number of insertions....Classified Advertising — Per Issue Rate: Classified advertising is sold at a rate of $45 per column inch....MARITIME REPORTER'S classified section carries more advertising and sells more products than any other publication in the marine industry. MARITIME REPORTER is published the 1st and the 15th of each month. Closing date for classified adver- tising is 20 days prior to the date of the issue. For further details contact John C. O'Malley at (212) 689-3266. Send all advertis- ing material to MARITIME REPORTER and Engineering News, 107 East 31st St., New York, N.Y. 10016. Engineers, Ship Construction Supervi- sors, M&R, Sales Engineers (chemicals, coatings, etc.) — to relocate anywhere. Salaries and fees negotiable; inquiries without obligation and in confidence. Nationwide professional recruiting, placement & search services for all segments of maritime industry. Responsible for maintenance and repair to vessels and hull structure. Makes recommendations concern- ing shipboard work methods, and responsibility for corrosion control program implementation and follow- up. Involved in operating and engineering budgets. Marine Engineering or equivalent and 10 years ship- board engineer experience helpful. Naval Architect and Ship Superintendent experience preferred. Chicago location, 30% travel. Responsibilities include administering the mainte- nance and repair of hulls, machinery and equipment and writing repair specifications. Position requires 3-5 years marine operating experience in handling shipyard repairs and negotiations. Chief engineer's license required. Slow speed diesel experience and knowledge necessary. Chicago based, travel required. AS SOON AS POSSIBLE OR SEND RESUME IMMEDIATELY! Numerical Control Applications and Programming Experience is desirable. If you qualify, there is excellent pay and a compre- hensive benefits plan available. Solid company with many years experience in marine, industrial, and export supplies, is seeking distributorships of well known products for these fields. To be sold in both domestic and overseas markets. IS LOCATED IN EAST COAST CITY. High tech Annapolis firm seeks results-oriented person to manage electronics group producing state-of-the- art ship control systems. MIL-SPEC requirements, and proven track record in defense-related electronics.